Phonak's Floyd Landis is rolling in yellow today, unveiling a yellow and black BMC frame, contrasting with the rest of his team's red and black. Discovery Channel has been very active in the day's probing breaks, with George Hincapie getting in a 15-man break that included 7 other previous stage winners. Davitamon-Lotto shut that break down, since it included Daniele Bennati, who could pose a threat to Robbie McEwen's green jersey. As that group was caught, Discovery's Yaroslav Popovych, Rabobank's Oscar Freire, Lampre's Alessandro Ballan, and Credit Agricole's Christophe Le Mevel attacked, and Phonak took over the chase. Popovych is 9 minutes back, the best placed rider in the break. Freire will be looking for green jersey points, while Le Mevel will want the stage win on Bastille Day. Some more bad news for Discovery Channel: Paolo Savoldelli abandoned at 43 kilometers into the stage, followed a few kilometers later by Benjamin Noval. Agritubel's Jose Martinez and Caisse d'Epargne's Isaac Galvez have also abandoned. With about 65 kilometers left to ride, the four-man break has 3:50 on the peloton. With about 50 kilometers to ride, the gap is 4:15, and the breakaway approaches the final sprint line. Freire leads Ballan, Le Mevel, and Popovych over the line, to move up one point behind Tom Boonen in 3rd in the green jersey competition. With 20 miles/31 kilometers to ride, the gap is still 4:25. Milram is helping Phonak at the front. The 4-man break is going to stay away. Freire and Ballan are good sprinters. Popovych is a level below that; look for him to try to launch late. And Le Mevel? I think he'll be hoping for strategic tacks in the road; I don't see him taking this stage. At 20 kilometers to ride, they have 4:40, and are working very well together. Eight Phonaks are on the front of the peloton. With 7 kilometers to ride, Popovych blisters the break, launching a strong attack. Freire goes all-out to catch back on, and Ballan comes across, but Le Mevel is done. Now Freire probes them, then Popovych attacks again, but he only gets 20 meters. Popovych goes again, but then softpedals. And again from the back, and he's got 30 meters, as they go through the 3 kilometer arch. Ballan has had to chase Popovych every time, and he's now hesitant to tow Freire up. Popovych has got 15 seconds now, with 2 kilometers to go. Freire and Ballan are chatting side-by-side. They're not going to bring him back like that. Popovych is in the town square, in sight of the line. He looks back, sees he's clear. Shifts up, zips the jersey, crosses himself 3 times, and takes the victory! Ballan is sitting on Freire's wheel; Le Mevel is coming back up. Freire doesn't contest 2nd, so it's Popovych, Ballan, Freire, Le Mevel. Now we'll see how Popovych moves up; the pack is coming into the final straight. Zabel and Hushovd are up front; Boonen has a leadout, Bennati is up there, and here comes McEwen...It's Boonen for the 5th-place field sprint, at about 4:30. Discovery Channel's Paolo Savoldelli crashed after hitting a spectator coming down from the stage finish today. Savoldelli reportedly needed 15 stitches in his right eyebrow. Many Tour riders chose to ride down to their hotels rather than wait for the traffic to sort itself out. Savoldelli, who finished 50th on Thursday, 23:04 behind stage winner Denis Menchov, is expected to make the start Friday. 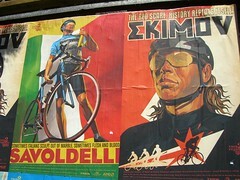 I was going to banish these cool “hero of the proletariat” style posters to the sidebar, but just couldn't. These are posted in San Francisco to promote Discovery Channel's “Race To Replace” in Indianapolis. There's at least one more, probably of Hincapie: That light blue below Savoldelli's poster has a Race2Replace logo at the top. Has anybody seen a full set? Are the posters available anywhere? 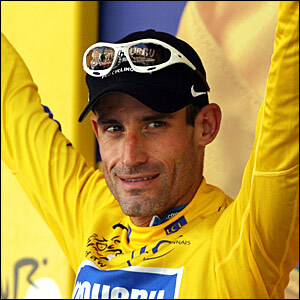 It has been suggested that Armstrong-acolyte Hincapie needs to develop a nasty streak if he’s ever to fill the Lance-shaped void in the Discovery Channel ranks. Judging by George’s bike and helmet-throwing antics beyond the finish-line today, that search can be considered over. Not since Robbie McEwen last sprinted has a bicycle been wielded with such menace. The Houston Chronicle offers an interview with Johan Bruyneel and George Hincapie on Discovery post-Armstrong, as well. After George Hincapie won the Tour's hardest stage, Discovery Channel went out and took the longest stage, as well. Giro champion Paolo Savoldelli spent the day in a big breakaway, then held the pace as it dropped to 8, then 4 riders. When CSC's Kurt-Asle Arvesen made his move, just outside of the 1k to ride marker, it looked like the winning move, but Savoldelli came back, catching Arvesen and passing him in the final 50 meters of the stage, for his first career Tour stage win. Back in the field, Alexandre Vinokourov decided he's not content with his GC placing, and blew the field in two at the day's final climb. Only 10 men were able to stay with Vinokourov, dropping Floyd Landis, Cadel Evans, and Christophe Moreau 20 seconds farther down the GC. Surprisingly, today's stage had no effect whatsoever on the green jersey competition, where Thor Hushovd continues to lead Stuart O'Grady and Robbie McEwen. Team competition update: Savoldelli's gap over Sevilla gives Discovery Channel the overall lead in the team classification: They're up by 37 seconds over T-Mobile, with CSC at 22:04 in 3rd. Popovych picked up 20 seconds in the white jersey competition by hanging on Vinokourov's late break. Sébastien Hinault takes the red race numbers of the day's most combative rider. Tim Maloney got a chance to talk to Lance Armstrong yesterday after Stage 4 at the Dauphiné Libéré yesterday, and covers a range of topics, from both the new Trek frames Armstrong is testing this week (the TTX for time trials, and the lighter SSLx he's riding on other stages) to Paolo Savoldelli's Giro win to what he's looking forward to after the Tour. One interesting nugget: Armstrong is still considering riding the ProTour team time trial in Eindhoven June 19th. There had been reports in March that he was a lock for the TTT. 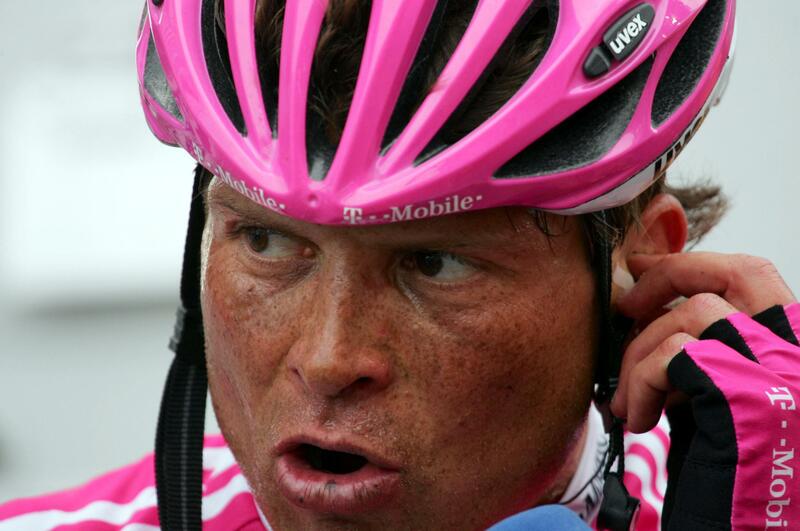 Armstrong picks Ullrich as Tour "big threat"
In an audio interview with Eurosport, Lance Armstrong said he's facing an "especially strong" field in the 2005 Tour de France. Apparently, Discovery Channel has 7 members of its Tour squad nailed down: Armstrong, Azevedo, Beltran, Hincapie, Popovych, Rubiera, and Savoldelli, with 2 spots still to be determined. Next up is the Dauphiné Libéré, starting Saturday, expected to be Armstrong's final tune-up for the Tour in July. "Jan is the big threat," Armstrong told Eurosport. "He's the one who wakes me up early every morning. He says he wants to beat me in the Tour de France. "Well, this is his last chance."